I recently got a book on how to make macarons. 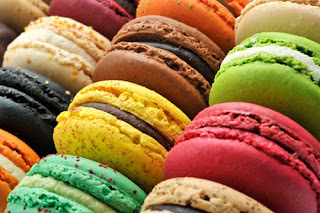 Macaron's are fancy french sandwich cookies. They are really light and delicately flavored. When done correctly they are beautiful. I thought if I could learn how to make them correctly, they could be beautiful gifts. So I made my first attempt yesterday. And I discovered I have a long way to go. First of all, they are made out of ground almonds, super fine sugar and egg whites mostly. So you have to grind the sugar, grind the almonds, whip the egg whites, etc. Another key thing is trying to get them all the same size and pretty. The recipe said to pipe them onto parchment paper on a solid cookie sheet. I tried a few that way. But I had just gotten a minutre Whoopie pie pan and thought it would be perfect. So I piped a bunch into it. These were raspberry flavored. The batter tasted great! After you get them piped. you tap the pan up and down a few times on the counter to try and get any bubbles out. You are also supposed to let them sit at room tempurture for at least 15 minutes, utp to an hour, to get their appropriate shiny texture. So then I baked them. I discovered that the they stick to things. The ones in the Whoopie pan, looked good in the pan, but got a little mangled trying to get them out. I also didn't quite have the depth that the ones in the photos had. But again, they tasted good! I put a little dab of raspberry jam and then a raspberry between the peices. Then I made a white chocolate ganache. Again, I had trouble getting it to the right consistency. It needed to be thick enough to be piped and used as frosting. Mine wasn't thick enough. It was my second try, it was late and I was tired, so I just went with it. So this is the tin of finished cookies that I made for my friend, Cindy's birthday. Not quite up to the standard of these. But they tasted so good, that I think I will try again. I think I need to weigh the ingredients to make sure I have the right balance of ingredients. I will stick to just the parchment I think. Try, try again!